This was written during WWII by a famous american copywriter. (He also wrote 'a technique for producing ideas' which still stands up today as a great guide). 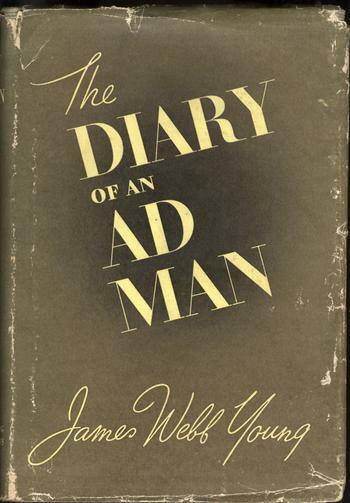 It started as a diary that ran in Ad Age, and was turned into a book later. Although Young was writing in a very different age and a very different world (and clearly he could be a bit of a git) a lot of what he says about advertising (and other more trivial stuff, like life) holds true today. I've going to fill the odd idle moment by quoting some of the stuff he said (assuming his estate don't have a big problem with that). Pleased to get from the Editor some letters which indicate that, now and then, somebody reads this Diary. Showed them to my wife - who still wonders why. If a man likes the sound of words, putting them together may be its own reward. But I notice that a neighbour of mine, who often sits on his doorstep of an evening, playing a flute to himself, doesn't mind a little audience either. A colleague here has a signed first edition of this book. He values it so highly that even the gloves you handle it with are kept under lock and key.